Halyard Kimvent Oral Care Swabs from HealthyKin.com are designed to assist the practitioner in providing proper oral care. I have used these for many years on my disabled daughter. I Individual wrapper and sterility are important factors. Excellent product with an excellent price which beats a competitor which was used by Medicare nursing visits while they were still coming to the house after our 96 yr old mother suffered stroke. Very helpful product. The sponge does not make very tender gums bleed, but is sturdy enough for good oral care. I like the paper stick better than the hospital's plastic stick. The paper stick gives if it is bitten. I wish the paper stick were as long as the hospital's plastic sticks, and that is my only criticism. 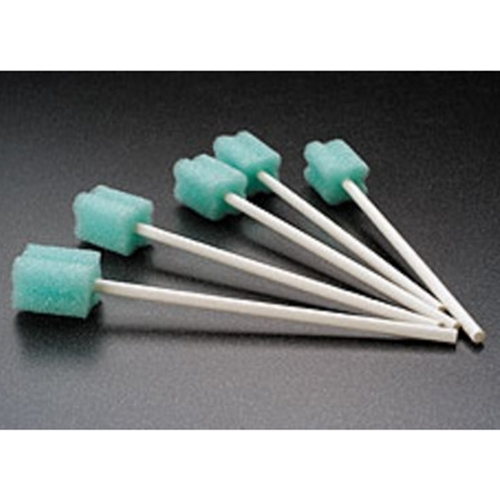 these work well to clean out a person mouth after a breathing treatment,because they are not flavor so they do not leave a bad taste in the mouth. Individually wrapped and hard enough to stand up for use as an oral swab for gum and teeth scrubbing. Even if my family member with dimentia bites down on the stick she'll not injure herself. Absolutely love these. Perfect for my handicapped son. So glad they come individually wrapped packs. Will definitely purchase these again. Love this product and it's easy to use.